We know the health concerns and dangers associated with sunburns for people. We have all had our share of too much sun after a day at the beach, hiking or just enjoying a day off relaxing outdoors. If your pooch is at your side while enjoying outdoor activities, don’t forget the sunburn protection for your dog. Sun, fresh air and exercise are good for our pets as well as for us. Rays from the sun aid the skin in producing vitamin D and helps balance calcium levels with metabolism. Enjoying summer sun doesn’t have to be painful for either man or dog. Dogs can and do get nasty sunburns, although not as easily as we do which can make it harder to determine if your pet is burned or not. Hairless, short haired and light colored breeds are the most prone to sunburn, but any dog can pick up a burn after a day in the sun. Because dogs are closer to the ground, they can get sunburned from above and from the reflection of the sun’s rays off a sandy beach or concrete. Like us, repeated burns can result in skin cancer and skin damage. Some breeds like Collies and Shetland Sheepdogs have a hypersensitivity to the sun and can get a condition known as “Collie nose.” However, any breed who has little to no color on their face are more susceptible to the sun than others. “Collie nose” can be a serious health issue for these dogs. Lesions can develop on their nose, eyelids and lips which need to be attended to in an early stage to prevent a deadly cancer that can develop if the condition is left untreated. Weimaraners and boxers need to be monitored carefully since they are more prone to cancer than other breeds. It’s important to follow a dedicated sunburn protection routine for these dogs. Signs that your dog is getting sunburned are the same for them as it is for humans. You will see redness on the bridge of your dog’s nose, the tips of their ears and tummy. They can also experience a loss of hair. The burn can blister and peel, and be just as painful for them as it is for us. Prevention is easy. Make sure your dog has plenty of shade during peak hours of summer’s heat. Even cloudy skies can let enough UV rays through for a nasty burn. Apply sunscreen, SPF 15 or higher, to their belly, ear tips, inside the legs and on the bridge of their nose. Look for lotions that have titanium dioxide as the active ingredient. Active dogs will need to have sunscreen reapplied throughout the day, especially if they are playing at the beach, in the water or running through tall grass that can wipe the sunburn protection off their bellies and legs. To help prevent sunburn, put a T-shirt on your dog. Doggles (dog sunglasses) help prevent sun damage to their eyes. You can even find a variety of hats at most stores that sell pet apparel. If you want the newest type of protection, a body suit made out of a spandex type material has hit the market. This suit will give your pooch the ultimate protection from harmful UV rays. It might also help him catch the eye of that cute Schnauzer that sits under the umbrella with her human companion watching his athletic abilities catching a Frisbee. It’s safe to use the same sunburn protection you apply to yourself, but be careful your dog doesn’t lick it off. Use baby sun protection if your dog is prone to lick the lotion off. Alternatively, sunscreen made specifically for dogs can be found at pet stores. Avoid lotions that contain zinc oxide. You can use it on their nose and ears, but if they ingest too much zinc oxide, it can cause gastrointestinal problems. If a sunburn occurs, keep an eye out for rawness or broken skin. Minor burns don’t usually require medical attention, but if your pet is showing signs of pain or raw skin, it would be a good idea to schedule a visit to your vet. Dogs enjoy being outside, especially with their favorite human. Just take it easy during peak sun hours (noon to 4:00 p.m). Find a nice shady spot for an afternoon siesta and avoid the sun’s dangerous UV rays. No one likes to deal with a sunburn, and that includes your pooch. 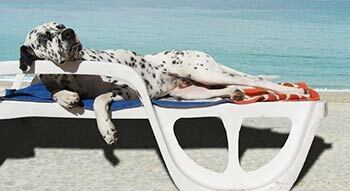 Remember sun protection for your dog and enjoy outside activities free from worry about sunburns.